Like so many individuals, I dreamt of going to a remote maritime destination on the North Atlantic coast. Luckily that was easily possible within a few hours ferry ride and drive from coastal Maine. First, we drove to Portland, Maine then took the ferry up to Yarmouth, Nova Scotia for the start of this 5-day trip. This Acadian land is appealing, especially the remote forests and waterways that border on the pristine shores. Our first port-of-call is the community of Western Shore, also known far and wide as the South Shore. A true pirate’s dream awaits as we turn onto Treasure Drive and into spectacular Atlantica Oak Island Resort & Conference Centre. In Nova Scotia, the luxurious Atlantica Oak Island Resort with water and land activities for all. 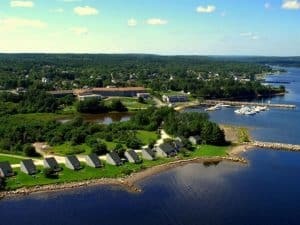 This first-class resort with its private marina located between Oak Island and Mahone Bay is a perfect getaway for romantic weekends. We’re also is ideally located for day excursions exploring the small villages along the South Shore. The resort provides an outdoor paradise to frolic in the indoor and outdoor pools or to savor a day on the water with kayaking, sailing, or just rafting before heading for the spa and salon. Incredible views of the bay have a soothing effect, despite the lively tales of plundering and buried treasure in the murky waters off Oak Island by pirates. The LaVista Dining Room serves delicious seafood with views overlooking the deep dark blue water. We enjoy live entertainment in the Fireside Lounge as the sun sets over the waterfront, the glow radiates an inviting, relaxing comfort. Wisps of music drift upstairs as a fierce-looking pirate figure stands guard over the treasure in the resort’s Oak Island Museum. We decide to investigate the latest rumors concerning the “Curse of Oak Island” as featured in the recent History Channel series. Making inquiries about finding this mystery haunt on Oak Island we discover its only minutes away. The local road turns into a narrow dirt causeway that is foreboding, as a posted sign forewarns about surveillance ahead. Not to be deterred, we drive off the causeway a few thousand feet to the entrance of an Interpretive Centre. Here are island tours sought by crowds of treasure seekers. Records show that bounty hunters have searched for this lost treasure since 1795. No one knows for sure, but Captain Kidd has been named as one of the pirates who might have buried bullion worth two million pounds sterling or the manuscripts of William Shakespeare! The mysterious treasure has intrigued countless numbers including the rich and famous. Franklin D. Roosevelt, who long before his Presidency invested in an expedition company seeking to find treasure in these wilds. Even today treasure seekers are compelled to join the search for treasure beneath the surface on Oak Island. 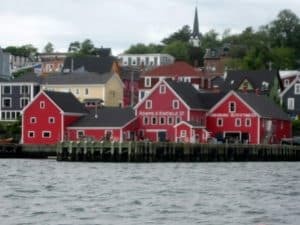 We leave treasure hunting behind and arrive in the colorful, picturesque fishing village of Lunenburg, home of the Bluenose II. Built-in 1963 this three-masted schooner is a replica of the original Bluenose. Bluenose originated as a nickname for Nova Scotians from the late 18th century. Today Bluenose II is a celebrated racing schooner and fishing vessel that captures the imagination as a magnificent tall ship sailing in the cold waters of the North Atlantic. As Nova Scotia’s sailing ambassador, the ship’s claim to fame is based on its outstanding racing record in never losing a single race. When in its home port in Lunenburg, this “Queen of the North Atlantic” welcomes visitors to climb aboard for hands-on adventures. Riding the waves in this classic ship is a sea lover’s dream, and its majestic presence sparks major interest wherever it sails. Continuing our adventure, we view extraordinary seascapes traveling the coastal roads along the Eastern Shore towards St. Margaret’s Bay. This scenic drive passes rugged terrain and small inlets that suddenly open up to dramatic vistas with ocean waves pounding against the jagged coastline. Captivated by the scenery at Peggy’s Cove, it’s a winding road to the steep, granite cliffs on Peggy’s Point. 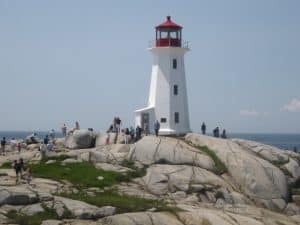 Here on the precipice above the rocky coastline is the world-famous Peggy’s Cove Lighthouse. Just beyond, a solitary bagpiper plays a melodic tune while we watch as the salty brine crashes on the shore below. 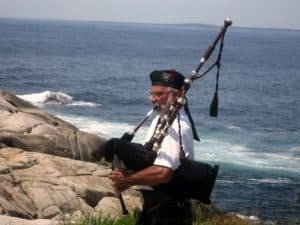 Nova Scotia provides many surprises including this Bagpipe Serenade on the Cliffs at Peggy’s Cove. Climbing the treacherous, granite outcrops create excitement and an extraordinary connection with nature. Our exploration takes us next to the northern part of Nova Scotia, the lush region of the Bay of Fundy and Annapolis Valley. Here is we stop at the UNESCO World Heritage site at Grand-Pré. This rural community commemorates the site of the former French settlement of Acadia which flourished prior to the mass exodus due to the British deportation during the French and Indian War. The historic site is a memorial to Acadians who struggled to keep their identity, despite the hardships of living in exile in others parts of North America. Although the Acadians no longer live in Grand-Pré, they are remembered and epitomized by Henry Wadsworth Longfellow in his poem, Evangeline, a fictional heroine in exile from her native land. These Acadian settlers are a cultural symbol of Canadian heritage and their bravery has been immortalized for future generations. On through the Gaspereau Valley where the fertile soil and cool breezes create a crisp, maritime climate influenced by the Bay of Fundy. In this terroir, the grapes are nourished in the rocky-clay soil that creates a perfect balance for producing different varietals. We stop to admire the plots of vines at Luckett Vineyards in the village of Wallbrook. Gazing out at the vineyards, rows, and rows of succulent grapes seem to extend all the way to Minas Basin. 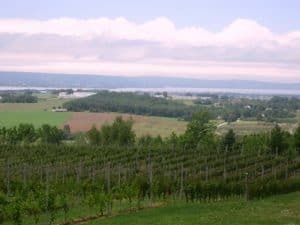 A view of Luckett Vineyards in the village of Wallbrook and their fine Nova Scotia grapes. The bright sunshine, cool breezes, and phenomenal ocean tides in the Bay of Fundy create an ideal balance for nature to produce luscious vegetation as we set foot into the vineyards. Grape producer, Peter Luckett, proudly introduces us to the fine Nova Scotia varietals that make his wines so special. The premier white wine, Tidal Bay, can be superbly paired with the region’s seafood that is in the harmony with the natural surroundings. Since 2010, Peter has created a thriving enterprise after turning his vast farmland into a major wine grape growing business that has attracted wine lovers from all over the world. Individuals visit the wine bar and outdoor restaurant in full view of the vineyard. Having a creative touch, Peter planted an old British phone box in the middle of his vineyards to let patrons call anyone in North America as a way of spreading good cheer. Extending warm hospitality to visitors, he creates an exciting tasting experience with some of the best wine in Nova Scotia. 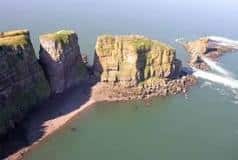 We traveled around Nova Scotia, exploring the beautiful, rugged coastlines, Peggy’s Cove and the Bay of Fundy offer challenging us to climb the cliffs above the ocean swells or to take a rafting ride through the tidal bore. 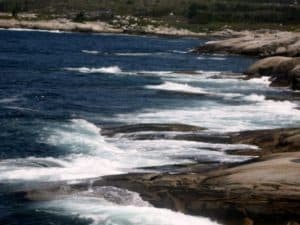 Ocean Swells Crash on the Rocky Coast at Peggy’s Cove and throughout Nova Scotia’s coast. These spellbinding moments seem magical, traveling through this marine paradise. Nova Scotia will appeal to anyone wanting to enjoy the outdoors on the edge of the sea. You will need a valid passport to enter Nova Scotia.